Indonesia’s Komodo island is home not only to the famous Komodo Dragon but also some of Asia’s most spectacular diving. Experience the smorgasbord of different dive conditions and incredible underwater life within this still largely unexplored marine park. It’s like diving at the edge of the world. Diving Komodo may no longer be true frontier diving since the first Indonesian dive pioneers began discovering the areas’ amazing dive sites a couple of decades ago, but it certainly feels like an intrepid adventure all the same. For a week on a liveaboard, there’s not another boat and barely another person to be seen — just the stunning blue of the wide open sky and sea, with silent, sun-scorched, red earth islands providing the backdrop to spectacular scuba diving. Komodo is home of the fearsome Komodo Dragon, the world’s largest lizard which can kill a human with a single bite from its bacteria infested, razor sharp teeth. The Dragons are the nearest thing we have left on the earth to a dinosaur and a still-living throwback to an age seemingly long gone. Komodo’s unique environment has led it to become a UNESCO World Heritage site and to be the heart of the 1817 square kilometre Komodo National Park. 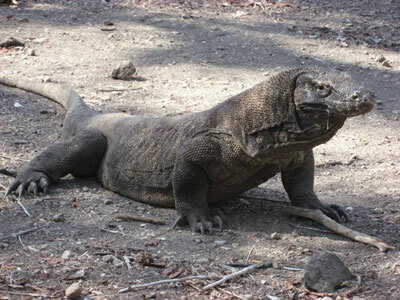 (For more about the Komodo Dragons, see my article on Travelhappy). On the day long voyage from Bali along the mountainous islands of Lombok and Sumbawa, it’s hard not to entertain the fanciful idea that you’re venturing into a real life Jurassic Park, a part of the world still largely unexplored, especially underwater. After all, the Komodo Dragons themselves were first seen by Westerners only at the turn of the 20th century thanks to the remoteness of their home island in the Indonesian archipelago. Who knows what else still lies out there both above and below the water? There was a fair amount of anticipation about our first dives at the island of Satonda off eastern Sumbawa, just outside the Park’s outer limits. Komodo diving itself tends to veer towards the more subtle delight of small creatures. Manta rays and sharks are known to appear in the environs of the national park, but they are more a bonus than a mainstay of Komodo’s incredibly rich underwater habitat. 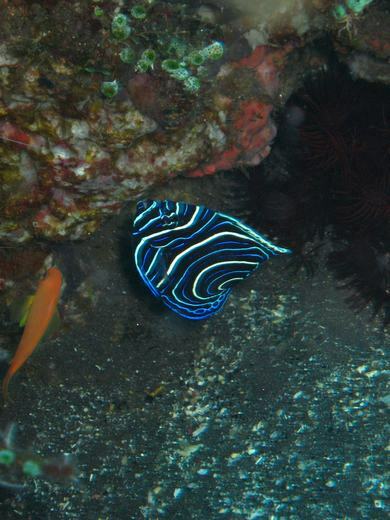 Highlights of our four dives at Satonda included a mantis shrimp almost as big as my fist, a bandit ornate ghostpipe fish, and — a first for me – the vivid blue and white swirls of a juvenile emperor fish which refused to stay still long enough for a photo as it fluttered around the eponymous Magic Rock. On top of that, there was a mass of coral life clashing and collapsing into one another in explosive colours on these sites – waving feather corals, shag pile rug corals, skyscraper shaped corals and towering minarets — it was all here. I couldn’t quite believe I’d seen all of this on the first day before we’d even got to Komodo’s star attractions. Another night of cruising brought us to into the Komodo National Park itself, and the island of Gili Banta. Here we had to miss out on diving at one of Komodo’s most famous sites, GPS Point, because the currents due to the recent full moon were simply too strong. Diving Komodo requires schedule flexibility to avoid the infamous Indonesian riptides which will wreck a good dive and should never be taken lightly. We had a mild taste of how powerful Komodo’s currents can be at Pantai Merah, where after dropping onto the reef we were treated to an impromptu drift dive which felt a little like entering hyperspace a la Star Wars. I can’t say I saw much of the reef during that dive, but the exhilaration of speeding across it was just as much fun. To make up for missing GPS Point, we dived K2 twice. There was a huge contrast between the brown volcanic mountains that make up Gili Banta and the brightness of the already savage early morning sun and the coldness and gloom beneath the water. Like most of the diving close to Komodo, a 5 mm wetsuit was needed for comfort, while the sites further away from Komodo were much warmer. The visibility was down to around 10 metres and the water was slate grey, as if there was a storm overhead. 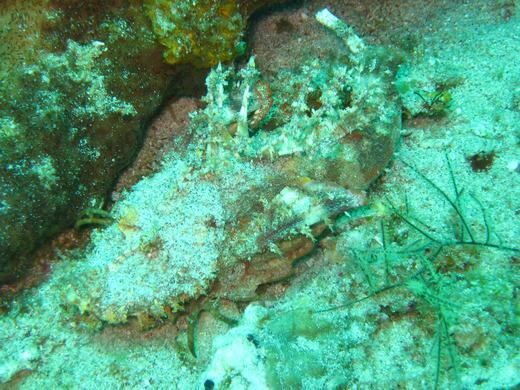 K2 yielded another first for me as I spotted a Demon Stinger, like a cross between a stonefish and a crab, the stuff of your worst nightmares — but thankfully only about eight inches long. I spent a good 10 minutes hovering around this mesmerisingly ugly creature as it impassively made its way along the sand. Our arrival at Komodo island the following day brought us face to face with the infamous Dragons, also unlikely to win any beauty contests, but hard to stop looking at for their sheer size and distinct air of malevolence. We spent two full days diving around Komodo and Nusa Kode, just off the island of Rinca, where we got to explore Komodo’s other “don’t miss” dive site, Cannibal Rock. 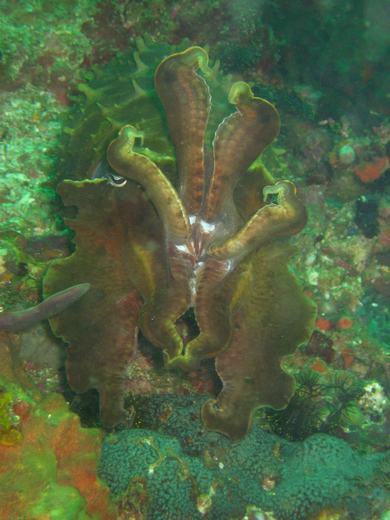 Supposedly named after a Komodo Dragon that was seen devouring one of its own on the shore nearby, Cannibal Rock is a big anemone-covered mount that drops from the surface to around 30 metres. Any misgivings about the poor visibility — around 8 metres – soon disappeared on arriving at the Rock. Frankly I wasn’t quite sure where to look first. Within seconds I’d had one of the biggest frogfish I’d ever seen pointed out to me, wedged in under a rock canopy, its mournful expression perfectly complementing its dour light grey colour. 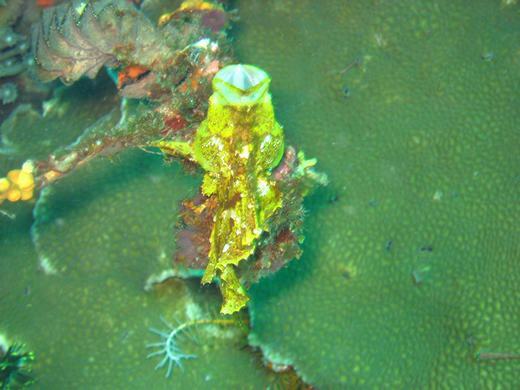 Considered rare in most dive locations, frogfish were so plentiful in Komodo as to become almost commonplace. 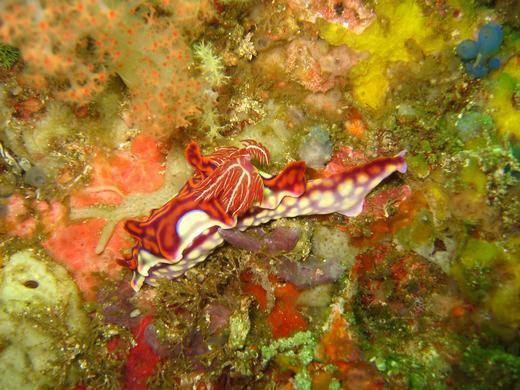 Over our two dives here, I found huge nudibranches at every turn, some up to six inches in length and explosive in colour. I couldn’t stop marveling at the size of these nudis, their giant size making it even easier to see their exquisite markings — and, as with the frogfish, they were to be a common sight on many of Komodo’s sites. While staring at one of them, I suddenly realized there was a big thorny cuttlefish nestled into the coral patch just besides the nudibranch, its colours blending perfectly with the background with only the occasional ripple of its skirt to give away its position. However, the main event for many of our dive group was a resplendent pygmy seahorse sitting in a fan coral, around an inch high and just about visible to the human eye but hard work for any but the most macro of camera lens to capture. One reef that was impossible to miss was Yellow Wall, an absolutely staggering vertical expanse of wall to wall soft corals that is indeed vivid yellow. There’s not a single inch of this craggy drop off that drops below 35 metres that isn’t suffused with vibrant, vivid coral swaying in the current, stretching in every direction as far as the eye can see. All too quickly it was time for the boat to swing back towards Bali and take in the dramatic diving at the still active volcano of Sangeang. Hot Rocks features great visibility, lustrous reefs and black volcanic sand through which streams of bubbles continually emerge, gassing off from the volcano itself. The dive site’s name comes from a cluster of rocks where you can literally warm your hands against one of the heat vents of the volcano. It is ridiculously pretty diving, a marked contrast to Cannibal Rock, with the volcano slope leading down to pygmy seahorses and white ghostpipe fish at around 30m. 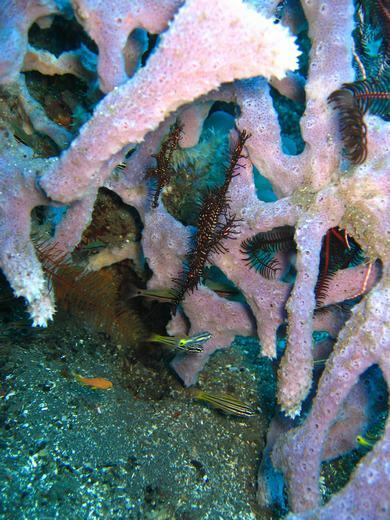 The abundance of reef is breath taking – swathes of soft corals with clouds of brightly coloured fish. It’s a picture postcard scene, complete with that saturated colour feel – but this is for real to the naked eye, not a trick of photo magic. The dive concluded with the riveting sight of a black and white banded sea snake shooting up the reef wall from 20 metres to 5 metres in as many seconds, and then breaking straight into the blue and heading for the surface. 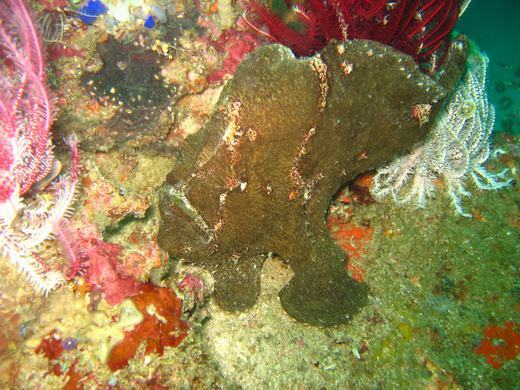 Sangeang’s Bonto Reef was another excellent example of Komodo’s superlative night diving. 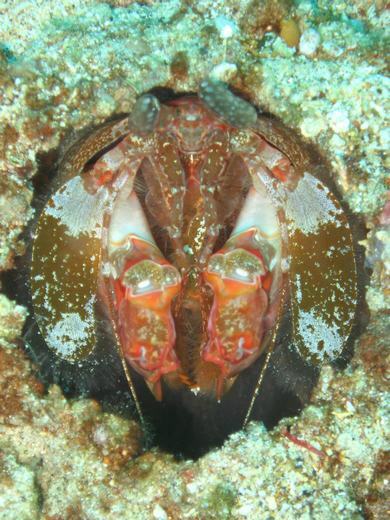 A whole new critter collection appeared after dark – lots of crabs, lobster, cuttlefish, moray eels and a juvenile boxfish hiding in the rocks, as well as several spearing mantis shrimp lurking in their holes. Indeed, Komodo’s night dives got rave reviews from our liveaboard’s group of divers every time they stepped back onto the boat — besides the usual suspects being continually spotted, some gems like an orangutang crab, which really is as hairy as its name, and a conch, slowly moving its beautiful shell with its sucker foot, made for happy dinnertime conversation. The biggest talking point was the Stargazer, a bulbous fish with an almost human looking face that lies half buried in the sand waiting for a meal to pass unsuspectingly overhead before it explodes upwards to catch its prey and then almost instantly reburies itself. Our final dives were back at Satonda, where spending some time with the jet black and orange tipped form of a juvenile batfish on my final dive provided a suitably spectacular finale. In seven days, I’d experienced a smorgasbord of different diving, from the bubbling warmth of Sangeang to the murky coldness of Cannibal Rock, and thanks to these different diving conditions, I’d got to see a plethora of bizarre and beautiful sea creatures with whom I thought I’d never come face to face. Komodo is one of those trips that stays long in the mind after returning to dry land and, more tantalizingly, a seven day liveaboard felt like it had just touched the surface of what could be seen down there. If ever you feel jaded about diving, go to Komodo — I guarantee it will restore your sense of wonder both above and below the water. Most nationalities can get a 30 day visa on arrival at Denpassar Airport. The visa costs $25 US Dollars, which is payable in Rupiah, Dollars or by credit card. Komodo can be dived year round. The rainy season runs from November to March, and the seas can get rough from the beginning of January through to March. The dry season runs from April to October. The waters around Komodo can vary quite radically in temperature, with some of the southern sites dropping to 22 degrees. A five millimetre wetsuit is essential for comfortable diving on some Komodo sites.